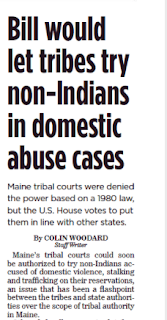 Maine's tribes have been excluded from provisions of the 2013 Violence Against Women Act that allow tribal courts to try non-Indians accused of domestic violence on reservations, but that may be changing. 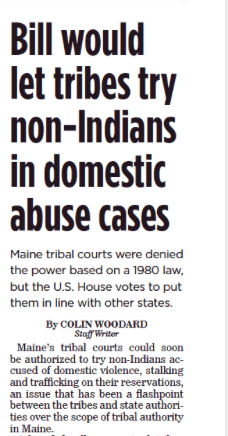 The Penobscot Nation court was blocked from participation when the state of Maine -- and then-attorney general Janet Mills -- argued VAWA did not apply to Maine tribes under its interpretation of the 1980 laws that settled the tribes' claim to more than half of Maine's territory. As I report in today's Portland Press Herald, the US House has just passed a revised version of the act with language introduced by Rep. Chellie Pingree (D-ME01) that would explicitly include the Maine tribes. For background and the bill's prospects in the Senate, please read the story. For deeper background, settled into the 29-part series "Unsettled" on the land claims, the Passamaquoddy, and the fraught state-tribal relationship.